At age 16 Stacy Taniguchi started his 100 list—100 things he wanted to do in this life (read about it here). Thanks to that list, he would climb the highest peaks, build his own house, coach Olympians, fly planes, and, eventually, study and teach at BYU. Now the Marriott School professor is a sought-after expert on, well, living. His research delves into self-actualization, specifically in wilderness settings, and he speaks far and wide on how to thrive—and how to make a 100 list of your own. Want to make a 100 list? Here are Taniguchi’s rules—plus a numbered template to print out and get you started. 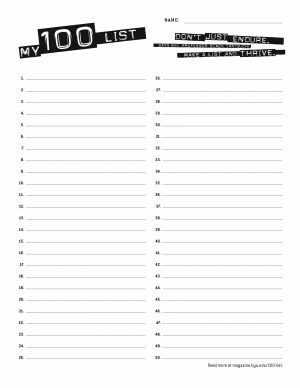 To print out this template, click here. Choose Wisely. It’s not easy to come up with 100 goals—it took Taniguchi years. “Usually people stall out around 20 or 30,” he says. “Then it gets harder to think through.” A question he often gets: Can the list be retrospective? “Absolutely.” Meaningful things you’ve already accomplished—add them. Take Some Risks. Add things that will stretch you, make you feel a touch awkward, whether it’s feeling like a stranger in a foreign land or trying to learn something new or tackling a fear. Those vulnerable moments will give you glimpses of your sublime nature, says Taniguchi. 1 of 10: One thing on Taniguchi’s 100 list: run a marathon. That led to several more marathons. Photo courtesy Stacy Taniguchi. 2 of 10: Stacy Taniguchi and his son Jared (the pair at left) grin on the summit of Denali. Summiting with Dad was a goal on Jared’s own 100 list. Photo courtesy Stacy Taniguchi. 3 of 10: In past years, Stacy Taniguchi has taken BYU students rappelling off of Moab’s Corona Arch, seen in the background. Photo by Bradley Slade. 4 of 10: Taniguchi spent weeks on the mountain, acclimating at each new base camp. Photo courtesy Stacy Taniguchi. 5 of 10: Stacy Taniguchi fulfilled his 100 list wish to build his own home outside of Anchorage, Alaska. Photo courtesy Stacy Taniguchi. 6 of 10: Taniguchi and another climber walking the ridgeline of Denali. Photo courtesy Stacy Taniguchi. 7 of 10: Taniguchi rappels from Morning Glory Arch. Photo by Bradley Slade. 8 of 10: Also on his list: summiting the world’s highest peaks. Here Taniguchi stands on Aconcagua, the highest in South America. Photo courtesy Stacy Taniguchi. 9 of 10: Stacy Taniguchi (top right) led the first Boy Scout troop to the top of Denali. Photo courtesy Stacy Taniguchi. 10 of 10: Injured on his Everest descent, Stacy Taniguchi had to crawl across the ladder crevasse crossings. Photo courtesy Stacy Taniguchi.